There are 92 professional football clubs in the UK and around 25% of the players within those teams are black. Despite the fact that the number of black players has continued to rise there are still only two black managers; Chris Powell of Charlton Athletic and Chris Hughton of Birmingham City. To say this is disproportionate is an understatement. This has led to mounting pressure being put on the FA from various angles to change the face of football. Despite having worked successfully with many young people for over 15 years as a coach, scout and mentor Andrew says, “it is extremely difficult for me to progress within the FA”. There are not only a lack of opportunities it may seem for black players to progress into top coaching and managerial jobs. It is practically impossible for black coaches who have not been players to secure positions in the boardroom regardless of how much knowledge they have of the game, how many years they have dedicated to coaching or how effective they have been. They have a uniquely valuable connection with their communities and invaluable relationships with the young players they coach, scout and mentor. Given his history in youth football in the Midlands a coach like Andrew should be turning down job offers. Despite sending several job applications for positions within the FA he has not even been invited for an interview. He like many others suspects that this has to do with having a face that does not fit. On this Andrew says, “ I don’t know if it’s because I am black or because I haven’t been a professional player and don’t have a reputation in the media or a combination of all of these things”. Andrews experience and history in football include becoming the first black coach and manager for the Nottingham City Schools Football Association in their 117 year history. He was invited by the Nottingham City Schools Football Association to accompany the Nottingham under 14s team on a trip to Karlsruhe Germany. “We played against two club sides Siemens Football Club and former Bundesliga Champions Karlsruhe SC,” he says. He ran the u13s and has coached all age groups starting from u11s up to the u15s culminating in playing the English Schools Football Association Cup. 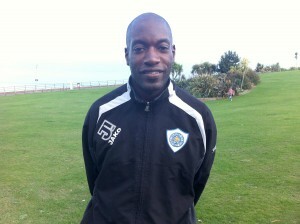 As well as coaching Andrew has been a tutor and worked in schools as a Learning Mentor, coach and PE teacher. He set up and coached girls and boys teams for primary schools that played in the Nottingham Schools Football Association Area League. The closest Andrew has come to an award for his achievements, was being nominated for Nottinghamshire Coach of the Year Award in 2005-2006. Andrew feels that there is a desperate need for change and hopes that by sharing his story others will be encouraged to speak out despite the fact that conversations about race make people feel uncomfortable. On the merits of his CV following one telephone conversation and a few emails Andrew was invited to be Camp Director for Premier Soccer Camps held in Lawrenceville New Jersey and Cornwall on Hudson, New York in July and August of this year. This conformed his feeling that “taking FA coaching badges in the UK is a waste of time and there are better opportunities elsewhere. America has opened my eyes to the fact that no matter what colour skin you have you are rewarded and given recognition for hard work.” Given the different response to his experience and skills working with young people by those he has met in the US Andrew is certain that the future of his career in football lies in finding opportunities outside of the UK. This entry was posted in Sport and tagged More Black Coaches, black managers. Bookmark the permalink.